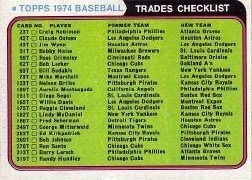 Topps introduced a new concept to the baseball card market with their release of the 1974 Topps Traded Baseball card set. It features a checklist of 44 players who changed teams during the course of the year. 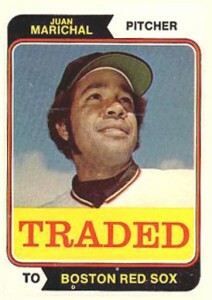 Nearly identical in design to that of the regular issue, the word "Traded" is spelled out in red lettering against a bright yellow background. The back of the card features a newspaper motif with headline and a write-up of the trade details. The card number is also accompanied by the letter "T" to further insure there was no confusion from the cards of the regular set. However, the design elements previously mentioned certainly accomplished that goal. 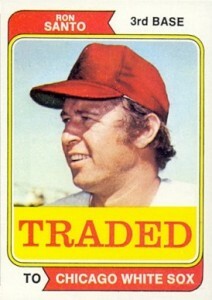 Key cards in the set include Ron Santo (#270T), Juan Marichal (#330) and the Traded Checklist (#NNO). Other names included on the checklist are Lou Pinella (#390T), Felipe Alou (#458T) and Steve Stone (#486T). The distribution of the cards were two-fold. The entire set was included with the purchase of the first-ever Topps factory set, which was only available at the time through the JC Penny catalog. The cards were also randomly inserted as singles in later-runs of the regular season issue.